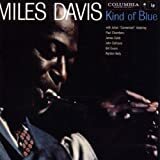 Trumpeter Miles Davis’ “All Blues” was recorded on April, 22, 1959, during the second session of his Kind of Blue album, still one of the best-selling jazz albums of all times. In fact Eric Nisenson devoted an entire book to its creation: The Making of Kind of Blue: Miles Davis and His Masterpiece. Pianist Bill Evans, who had influenced Davis’ interest in classical music and the use of modes, was instrumental in developing the concept of the album. Evans left Davis’ group in 1958 and was replaced by Wynton Kelly; however, he returned for the Kind of Blue session. The more deeply blues-oriented Kelly played on only one cut, “Freddie Freeloader,” during the March session and was not present during the second session in April. In order to capture the spontaneity of the sessions, Davis did not write out the compositions, bringing in only harmonic sketches for his sextet which included Cannonball Adderley on alto sax, John Coltrane on tenor sax, Paul Chambers on bass, and Jimmy Cobb on drums. In 1965 Davis revisited “All Blues,” recording an up tempo version with his energetic young quintet which included saxophonist Wayne Shorter, pianist Herbie Hancock, bassist Ron Carter, and drummer Tony Williams for his Live at the Plugged Nickel album. In addition to earlier recordings of “All Blues” by such jazz stalwarts as Oscar Peterson, Milt Jackson, Tal Farlow, Bill Mays, Freddie Hubbard, and Al Grey, many artists have recorded the tune since 2000: the gospel group Take Six (2000); guitarist Mimi Fox and pianist Jean-Michel Pilc (2001); saxophonists Donald Harrison (2002) and Frank Morgan (2004); pianist Marian McPartland (2005); drummer/vocalist Grady Tate and pianist Milcho Leviev (2006); and in 2007 saxophonist Harry Allen, guitarist Kenny Burrell, and pianist Marc Copland. Two more live sessions by Miles feature his composition. The first, from 1964, has nice work by tenor saxophonist George Coleman and pianist Herbie Hancock. Hancock, along with fellow rhythm section members Ron Carter (bass) and Tony Williams (drums), had just been together with Davis for a few months, but already it is evident that they were a coalescent team. The next year, with Wayne Shorter replacing Coleman, the group was again captured in a live performance that clearly indicates Miles and his cohorts delving into more avant-garde jazz.